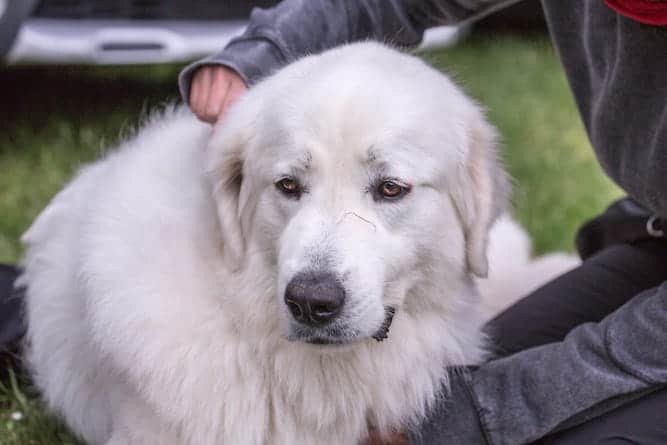 The Great Pyrenees Temperament: (Patient, Affectionate): Do You Have Room in Your Heart (and Home) for This Gentle Giant? Before adopting the Great Pyrenees, it is important to know that he has a kind and gentle temperament. He is a loyal and friendly dog who is naturally gentle and composed. He especially gets along well with children. Due to his versatility, he is a wonderful companion who is just as protective of his family as he is herds of livestock. 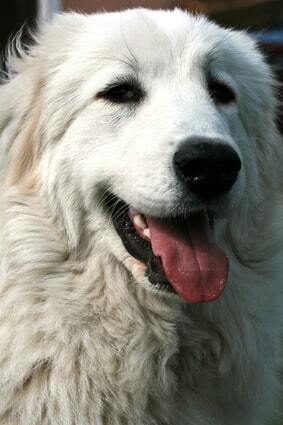 Above all, the Great Pyrenees is a sweet, affectionate dog who loves spending time with his family. He is usually patient with his own children, but when the neighbor's kids come over to play, he can become overprotective. To combat this, expose him to as many people as possible while he's young. This is a self-assured, regal dog who is confident in his movements and in his ability to judge whether a newcomer is a friend or foe. The Great Pyrenees can be a territorial dog, which he gets from his history of guarding over flocks. Because of his territoriality, he is also fearless. No one messes with his family (“flock”) and gets away with it. He is independent, sometimes to the point of being stubborn, but this adds to his ability to protect his family when necessary. Some dogs in this breed can be obstinate, dominant, willful and manipulative. To deal with this temperament before it gets out of hand, you must be firm and consistent with the commands that you give to your canine friend. When you give this dog any instructions, you should show him that you mean what you say. The Great Pyrenees is a dignified, gentle dog who takes pleasure in the calm. While researching the breed, you may become confused differentiating between the Kuvasz vs Great Pyrenees. 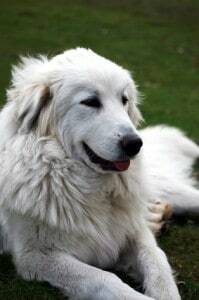 However, the Great Pyrenees is usually bigger than the Kuvasz, and the Kuvasz typically has no markings on his fur. The Great Pyrenees has been around for hundreds of years. They started out as shepherds' dogs, guarding flocks of sheep and goats. In fact, Varro, a Roman author, wrote in 37 B.C. that the Great Pyrenees was an essential guardian for all livestock, but especially for those that produced wool. He added that the Great Pyrenees was the best tool against the wolves who would scout out herds as prey. Back in the 1600s, the French aristocracy's dog of choice was the Great Pyrenees. The Great Pyrenees is not aggressive by nature, but if you do not train him or properly socialize him, then he can become aggressive. To minimize a potentially bad temperament, it is important to choose the right dog. Dealing with a good breeder helps. If you choose to buy an adult Great Pyrenees instead of a puppy, then you should spend some time observing the dog’s behavior and avoid one with negative traits. But Good breeding and your careful selection of a dog can only go so far. How you interact with the dog after you bring it home will have a lot to do with your Great Pyrenees' temperament. This is why it is so important to invest the time and resources necessary to properly train your Great Pyrenees. The first two years of a Great Pyrenees' life are critical to his development. During this time, you must be committed to and patient with him. Show him that you are the leader here by being assertive in your training methods. The Great Pyrenees is not naturally kind to strangers and new situations. To deal with this problem properly, you should socialize him with other people, including children, while he is still a puppy. Maintaining a constant level of exposure into adulthood will help the dog recognize that strangers are not always a threat. This kind of interaction helps the dog learn to distinguish between different human behaviors, such as playful wrestling between friends versus fighting. If you are considering owning a Great Pyrenees, you should be able to exercise him to keep him healthy and lean. The Great Pyrenees loves going for long walks every day, which is great because walks provide good exercise. Note that too little exercise can cause fragile bones and weaker ligaments and joints. Avoid taking the dog out for exercise in humid or hot weather to prevent heat exhaustion. This dog loves romping in the snow, though, so if you live in an area where it snows, he'll be very happy. You may be wondering, do Great Pyrenees like water? Really, it all depends on the dog. Some love to splash around in the bath, while others would rather avoid it. Most of the health issues that affect the Great Pyrenees are actually common to dogs with larger faces. Who knew? especially if they are kept in very hot or tropical conditions. In case your dog gets any of these conditions, you should consult a qualified vet. 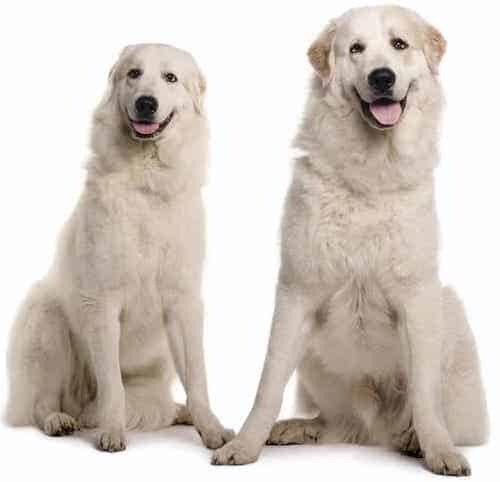 A full-grown Great Pyrenees size is between 28 and 32 inches high for a male, and 26 and 29 inches for a female, so they're pretty tall dogs. A healthy Great Pyrenees weight is between 110 and 120 lbs. for a male, and 80 and 90 lbs. for a female. So if you like big dogs, this is definitely the dog for you! The Great Pyrenees lifespan for an otherwise healthy dog is between 10 and 12 years. Note: Don't let the many issues above scare you. The best way to approach health problems is to prevent them in the first place. The Ultimate Guide to Dog Health is a great place to start. Get a copy to keep at home. 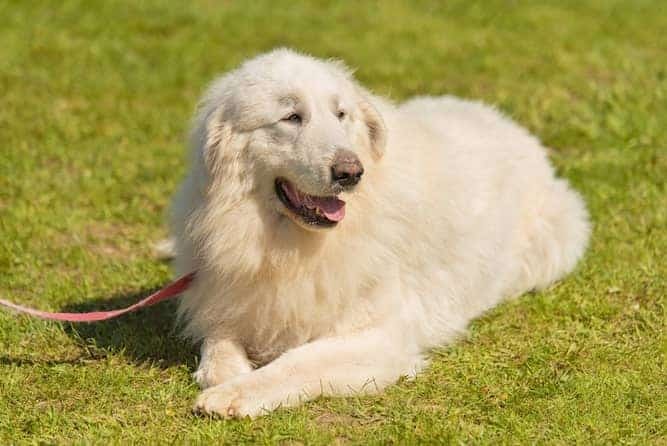 It will help you prevent the painful health issues that can plague your Great Pyrenees pet from expressing his winning personality and maximizing his life expectancy. To keep your Great Pyrenees always looking good, brush it regularly especially because for the Great Pyrenees shedding is a year-round thing. They also shed heavily once a year. You need to brush the dog’s undercoat to remove all dead and loose hair. You can bath the dog as needed. So you've decided that you'd like to add a Great Pyrenees puppy to your family. Congratulations! You can find a Great Pyrenees for sale either from a breeder or through an adoption agency. The average Great Pyrenees price is around $600. However, some breeders may charge as much as $5,000 for a Great Pyrenees puppy! If you want to adopt a Great Pyrenees, you may be able to find one at your local animal shelter. Dogs are constantly going in and out of the shelter, so you may not be able to find a Great Pyrenees rescue right away. But don't be discouraged – keep checking back, and you may finally land the dog of your dreams. If you're interested in a mixed breed, a shelter is a great way to find one of these. For instance, you may be interested in a Great Pyrenees Anatolian Shepherd mix. Shelters find themselves inundated with mixed breeds, so it's more likely you would find this mix at a shelter, rather than from a breeder. The price of a Great Pyrenees varies so wildly because it all depends on where you get the dog from. It's up to the breeder how much he or she decides to charge for a puppy, as well as the purity of the dog's lineage. Don't lay out that kind of money without doing some research first, though. Make sure the breeder has the necessary health clearances and certifications for the dog you're interested in. The worst place to buy a dog from is a pet store or puppy mill because you can't be sure that you're getting a dog who isn't sick. You should always steer clear of breeders who choose to sell their dogs at these places. Is the Great Pyrenees right for you? If you want a large, rugged dog, then the Great Pyrenees should be your first option. Here you have a dog that closely resembles a majestic bear – only this “bear” will protect your chickens, sheep, goats, and horses, not hunt them. The Great Pyrenees is not the right choice for you, however, if you don't enjoy a heavy dog who loves to sit on your feet. He can also be destructive when he's bored, so if you need to leave him alone for long periods, then you're probably not a good match. The Great Pyrenees falls in the dog group known as the Working Group. Dogs in this group are strong, large, and excel at tasks such as rescue, pulling, and guarding. It should come as no surprise to you that they are typically smart, resourceful, fast learners and make great companions. Conclusion: Why the Great Pyrenees? 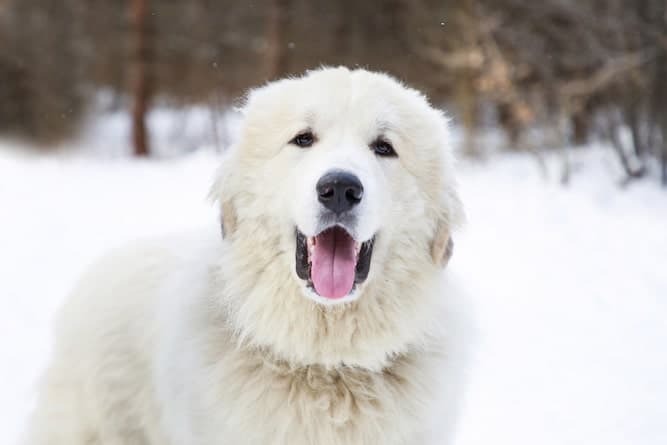 The Great Pyrenees temperament makes him a huge, fluffy bear of a dog who guards his family with his life. He is calm, quiet, and regal, but don't let that fool you. He won't pass up the opportunity to go for a romp in the yard (especially if there's snow around) or, depending on the dog, a dip in the pool. He is a big, hefty dog, so if you love big dogs, then he's the dog for you. Just don't confuse him with a Golden Retriever. He's more likely to go off and do his own thing than to live for his master's praise.